Hi all! Today I have a very cute art card using one of Rick St. Dennis’s Christmas digital image, “Christmas Dress,” available at I Brake for Stamps (IBFS). If you are one of those that just have to get your rubber stamps out to feel the thrill (I know that I am), you can also find her in a single rubber stamp or in a sheet of four amazing rubber stamps. 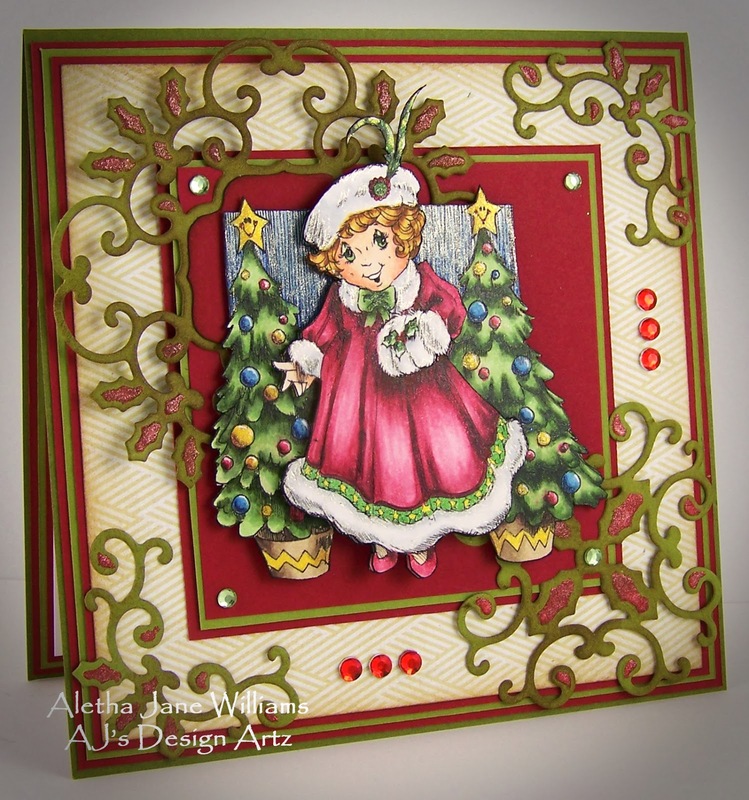 I used Spellbinder’s Holly Motifs dies and cut the motifs from Old Olive cardstock. After doing the final assembly for the whole card I added some sparkle with Red Wink of Stella brush markers. I added a few red and green crystals and I think she's ready to show off her new Christmas dress. Thanks for stopping by. I hope that you stop by our IBFSblog every day. I am sure you can pick up some inspiration from some very talented designers. Check out our IBFS Facebook page for all the happenings at IBFS. I hope everyone has a great week! Stunning work, Aletha! Your coloring is beyond amazing and your card design is pure perfection! I love the fussy cut layers! It adds such wonderful dimension! 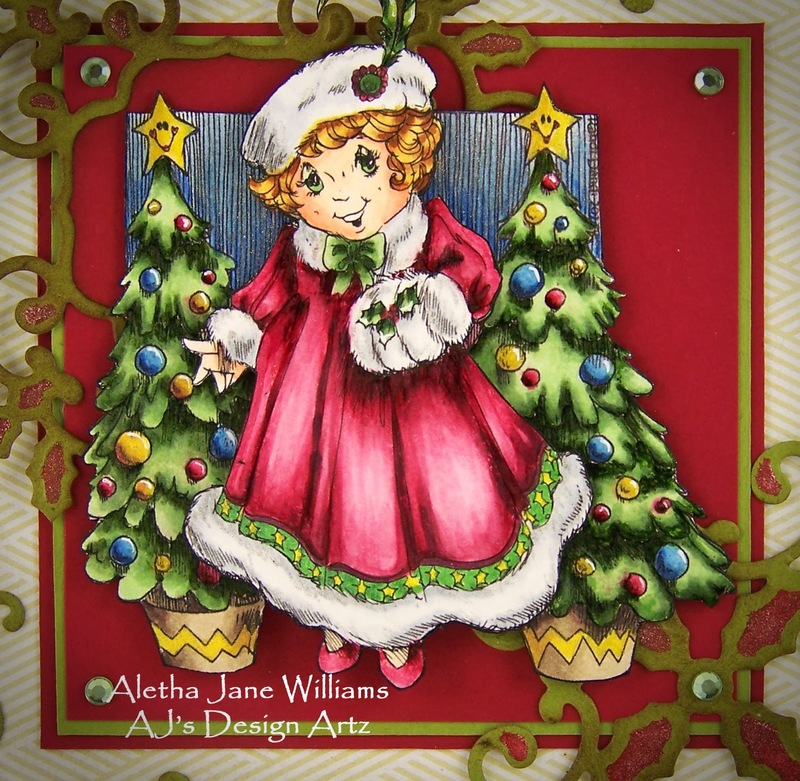 OMG Aletha this is absolutely stunning! I love everything about it. Your coloring is fantastic. I'm blown away by your artwork! Not only is your beautiful coloring sheer perfection, but to find out you fussy cut that image twice! I'm amazed. The added detail of the swirls in the background give just the right touch. You are a true artist!